The Packard's emergence as a neighborhood anchor and a new Midtown residence has been amazing to watch. I first heard about the Packard's sale between Cash Cunningham and Regan Development two years ago from Pyramid broker and neighborhood advocate Bob Bininiszkiewicz. What I didn't know about the deal was that Cash had purchased the site in 1997 at the City's tax sale for $20K! 1325 Main Street was designed by Albert Kahn in 1926. 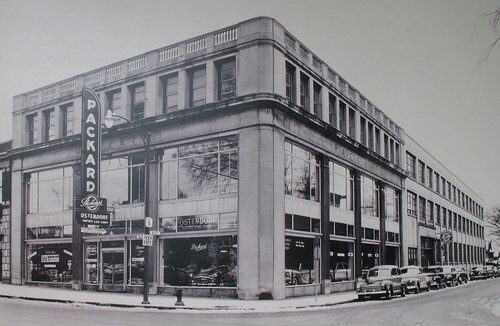 Kahn designed many of Packard Motor Car Company's buildings including Buffalo's first Ford factory - the Tri-Main. The Packard's black metal conical water tank - with 'Packard Motor Cars" in historic script done in white over a red hexagon, a symbol that appeared on original Packard wheel discs - has long been a fixture here in Midtown. Here's a link to the National Register Application for additional details about the building's architectural, historic and industrial significance. There are 40 new residences with exposed concrete piers and tall ceilings. These are very cool spaces. New York State's Division of Housing & Community Renewal released the following today about the Packard - good news! 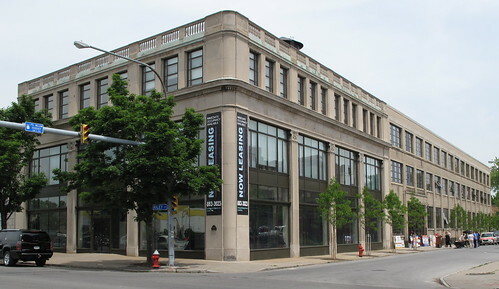 One block away Artspace occupies the recently renovated industrial building that once housed the Buffalo Electric Vehicle Company where electric cars were manufactured in the early 20th century. The neighborhood is also home to Lourdes Church and St. Vincent's where the future of both iconic structures remains uncertain. Here's a short flickr series - The Packard. 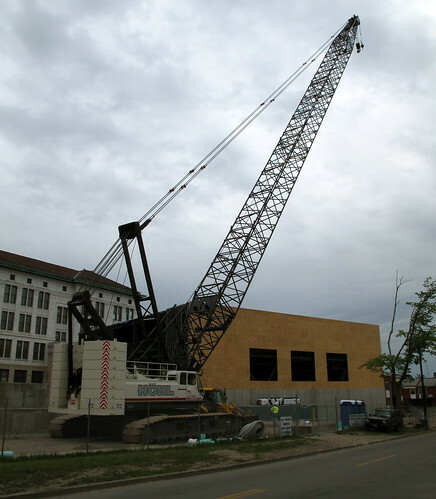 I spoke with the crane operator on Monday afternoon and learned that the structural steel for the new 'all high' gymnasium will be delivered to the site on Tuesday, on schedule. The natatorium recently received a roof and the sides are now wrapped in plywood. Hamilton Houston and Lownie, the Buffalo based architectural firm heading up this project, recently placed a sign on the fence. HHL took the lead two years ago at Artpace, a few blocks away. I spotted this west elevation on HHL's site this evening. 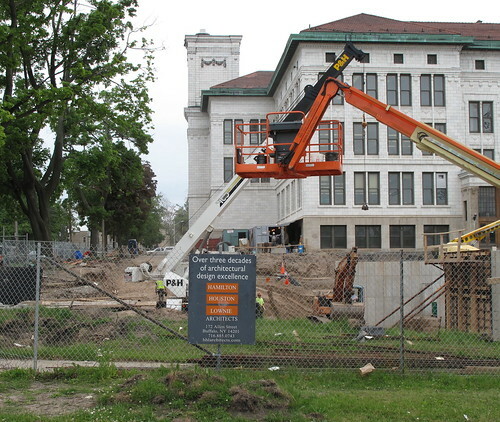 It's the view across the new playing field and Michigan Avenue which is also the school building's historic front entrance. 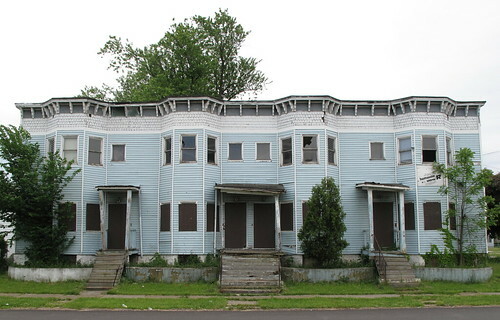 The Woodlawn Row Houses are still available. They're owned by the City of Buffalo and seemed to have weathered the winter rather well. No roof leaks - yet. If you're interested in taking them on as a rehab project, let me know. There's an interesting maze to negotiate at City Hall. I may be able to help. Please visit the Woodlawn Row House archive for additional information.